David Farren creates a snapshot of everyday urban life. 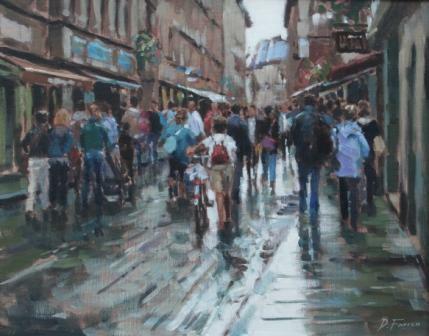 We observe but are also involved in the movement and energy he expresses in his cityscapes. ''After the Summer Shower'' shows Farren''s skill in capturing the changing light and atmosphere of a wet city street. We observe the moving crowd as if we are part of it, the life of the city. David Farren''s aim is to capture the ambience and individuality of some of the world''s most exciting cities from a street level, concentrating on the people as they go about their daily lives. He produces his paintings in acrylic and oils, enjoying the immediacy and versatility of both mediums which he finds particularly well-suited to his direct, impressionistic and expressive style of painting. David has exhibited widely across the U.K. with great success and, as well as exhibiting at Red Rag Gallery, his accomplished and atmospheric paintings can be found in leading British Art Galleries and collections across Europe and America. Each painting at Red Rag is sourced from the David Farren artist studio and like all Red Rag British art and Contemporary art it can be shipped worldwide.